The Brisbane Valley Rail Trail is Australia's longest recreational rail trail at 161 kilometres long from Ipswich to Yarraman. The rail trail follows the old railway line along the western side of the Brisbane River and travels through farming landscapes, native and plantation forests and rural-residential and country town settings. The Brisbane Valley Rail Trail is great for taking a relaxed walk, burning a few calories with a run or jog and is a popular spot to walk your dog, go for a bicycle or horse ride. The original rail line was built in the 1880s to transport timber, milk and beef to Brisbane and supply farmers and towns along the railway line. The last rail service was in 1989. The section of the Brisbane Valley Rail Trail between Coominya and Esk is 24 kilometres long and a moderate to high level of fitness is required. Coominya means a "view of water" and is an adaptation of the Yugarabul Aboriginal name Kung-i-nya from "kung" meaning water and "nya" meaning to see. Mountain biking, horse riding, and walking are permitted on the Brisbane Valley Rail Trail. This section of the trail is owned by the Queensland Government Department of Transport and Main Roads. 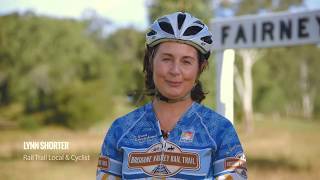 The section of the Brisbane Valley Rail Trail between Esk and Toogoolawah is 19 kilometres long and a moderate to high level of fitness required. This section of the trail is owned by the Queensland Government Department of Infrastructure, Local Government and Planning. The Brisbane Valley Rail Trail officially starts at Diamantina Boulevard in Brassal, after connecting with the Brassal Bikeway. From here trail users head 20 kilometres north to Fernvale. Although the station buildings no longer stand along this section of the trail, replica signs have been installs at Muirlea, Pine Mountain, Borallon, Wanora and Fairney View. The section of the Brisbane Valley Highway between Moore and Linville is seven kilometres long and a moderate level of fitness is required. The section of the Brisbane Valley Rail Trail between Fernvale and Lowood is 8.5 kilometres long and a low to moderate level of fitness is required. This section of the trail is owned by the Queensland Government Department of Infrastructure, Local Government and Planning. 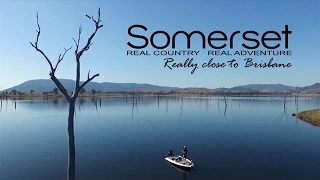 Somerset Regional Council assist the Queensland Government by maintaining this section of the rail trail. The section of the Brisbane Valley Rail Trail between Linville and Blackbutt is 22.6 kilometres long and a low to moderate level of fitness is required. The section of the Brisbane Valley Rail Trail between Lowood and Coominya is 12 kilometres long and a moderate to high level of fitness is required. The section of the Brisbane Valley Highway between Nukku Rd and Yarraman is 14 kilometres long and a moderate level of fitness is required. The final section of the Brisbane Valley Rail Trail, opened in August 2018, making the Brisbane Valley Rail Trail the longest recreational rail trail in Australia. A must see on this section is the Yimbun Tunnel, north east of Toogoolawah. Harlin provides a good halfway stop with toilet facilities at the rest area.